Show how the networked home is changing our lives – with diagrams, graphics, explanations and more on the current trend topic, smart home. Smart home is the name for a household containing networked appliances using Internet of Things technology. The purpose of IoT is to unite the physical world with the digital world, allowing intelligent devices to communicate with each other and people. Therefore, smart homes are also often called intelligent homes. Networking devices in private homes improves their efficiency, safety, and convenience. This type of technology is becoming increasingly important for entertainment, communication, security, energy, health, and home automation. For example, smart home functions can provide everyday support for elderly people with health problems. Smartphones and tablets can be used remotely to ensure that all doors and windows are locked and to control heating, lighting, and other household appliances. 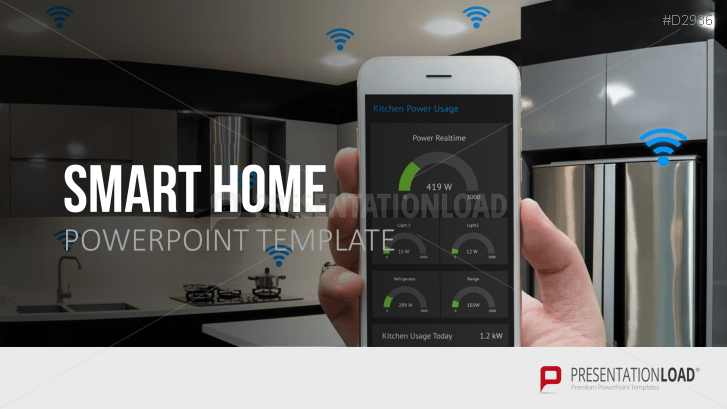 This PowerPoint template offers you the perfect platform for your smart home presentation. It provides a clear overview of smart home technology and functionality, explains the advantages and disadvantages, and offers examples of how this innovative technology can be applied in private homes. In addition, you can present your employees or customers with checklists that can be used to plan a smart home transition.